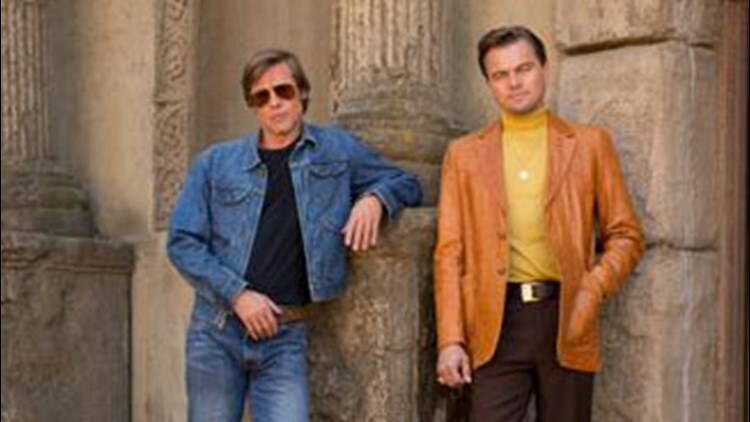 Brad Pitt and Leonardo DiCaprio are seen in all their 1970s glory in the first set photo from Quentin Tarantino's Manson murders movie "Once Upon a Time in Hollywood." Thanks to the forces of gravity, anyone who's over 40, not drastically underweight and adopted the unnaturally model-y poses favored by Instagrammers has probably been photographed with a double chin. Well, he did until some overzealous photo editors at Sony Pictures saw that double chin and Photoshopped it out of a June promotional photo showing them in character in Quentin Tarantino's next movie, "Once Upon a Time in Hollywood." due July 26, 2019. According to Page Six, the first outlet to notice, Sony mistakenly uploaded a previously unpublished photo to its press site that when compared to the released version, shows that DiCaprio's chin was retouched and wrinkles were removed from Brad Pitt's chin. The actors "did not request any retouching of photography," Sony and the "Once Upon a Time" production team stressed in a joint statement to The Wrap. "We take full responsibility for the error." Representatives for DiCaprio, Sony Pictures and production company Heyday Films did not immediately respond to USA TODAY's request for comment. "Once Upon a Time" is set in the Los Angeles of 1969, when followers of cult leader Charles Manson murdered pregnant actress Sharon Tate (played by Margot Robbie, who shared a first-look photo of her in character Monday). DiCaprio, 43, plays Tate's next-door neighbor, Rick Dalton, who once starred in Westerns, but is now struggling to find work. Pitt, 54, plays his housemate and longtime stunt double. So in this case, the double chin and wrinkles might have actually made them look more authentic. And if DiCaprio and Pitt, two of the most powerful men in Hollywood, aren't allowed to age naturally, just imagine how actresses over 40 feel.